You can approach Wilhelmshöhe with the trains of the Deutsche Bahn and from there use a tram and a bus to approach the park. You can approach Park & Palace Wilhelmshöhe through the L3217. This street will lead you directly to the park. Under the Palace is an opportunity for parking. From the main train station in Wilhelmshöhe you have to take the tram 3 to Kassel Drusental and switch to the bus 22 to Kassel Herkules. From there its a 2 minute walk to the palace. The beautiful mountain park in Wilhelmshöhe is the largest one in Europe, which is a unique work of art. You can find a variety of sights in this park. Since 2013 it is on the UNESCO World Heritage list. The mountain park is known as a baroque complex with a mighty palace. By taking advantage of natural conditions it has created a sprawling, idealized natural landscape with waterfalls, aqueduct and fountain. In the years 1786 to 1798 the palace was built for Landgrave Wilhelm IX. It's in the style of classicism and could be restored very quickly after the World War II and converted to a museum. Internationally it is known for its current use as a museum, which contains amongs others the collection of antiquities and Old Masters Picture Gallery. The mountain park is the largest one in Europe, which is a unique work of art. The UNESCO calls it a park of exceptional and unique example of monumental water architecture in the European absolutism, that is why it is listend of the UNESCO World heritage list since 2013. Different kind of events take place in the park, such as the water games with 750,000 liters of water. Don't miss the chance in summer to come and to see this event and the park. Its beauty will overhelm you. You have to see this once in your lifetime. Only 11 minutes away you can find the Golf Club Kassel with 18 tracks. The club house and playfully challenging course are located on 510 meters height in the middle of the forest. Golf lovers can hit some balls in a very beautiful surrounding and nature with being just a guest or getting a member. The area around and in the park is very famous for their water games. The production function are today still the same as they were at the times of the Elector and Landgrave. For a performance 750 cubic meters of water are required. There are no technical means used for this spectacular show in the park. In the Park Wilhelmshöhe you can find the Copper statue of the Greek demigod Hercules since 1717, which is considered as a landmark of the city Kassel. The entire building reaches a height of 71 meters and from the visitors platform you can enjoy a magnificent view on the Baroque park and the city. This historic hotel with restaurant is located in a park beside Wilhelmshöhe Palace, at the foot of the Herkules monument. Kassel city centre is a direct tram ride away. 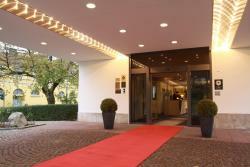 The 4-star Schlosshotel Kassel offers rooms with views of the city. This Hotel Palmenbad offers modern rooms, a daily breakfast buffet and an international restaurant. It is located in the Wilhelmshöhe district of Kassel, less than 1 km from the Schlosspark. This hotel lies just a 10-minute car journey from Kassel’s centre, only a 20-minute walk from Schloss Wilhelmshöhe castle and its extensive parkland , home to the impressive Hercules monument.